Is The USA Seeking to Oust Duterte? 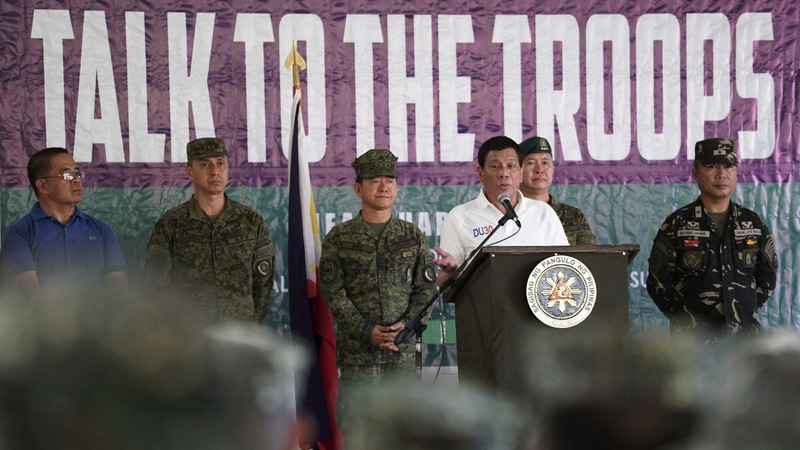 – Coercion Code – "Dark Times are upon us"
The U.S. is beefing up its military presence in the Philippines, claiming that the Philippines government requested their aid. However, President Rodrigo Duterte announced on Sunday he made no such request, raising concern that the U.S. may have an ulterior motive. MANILA — In late May, the Philippines became the first nation in Asia to have one of its cities fall to the terror group Daesh (ISIS) and its affiliates. The southern city of Marawi was overtaken by hundreds of gunmen who took control of multiple landmarks and the majority of the city’s residential areas. In response, President Rodrigo Duterte declared martial law in the entire region of Mindanao, where Marawi is located. The Philippine Army in a statement cited by Reuters asserted that the U.S. had no “boots on the ground” in the fight and is only offering technical assistance to Philippine forces seeking to reclaim Marawi. The U.S. Embassy in Manila has stated that the U.S. offered the support to the Philippines at the request of the Philippines government, though they refused to provide further details on the alleged request. The Pentagon also confirmed increased U.S. military presence in the Philippines, stating that it is providing Philippine forces with aerial surveillance and targeting, electronic eavesdropping, communications assistance and training. It also stated that 300 to 500 U.S. troops are in the country to “support regular training and activities,” though no further details were given. But less than a day later, the U.S.’ justification for its increased military presence in the Philippines fell apart, as Duterte said at a press conference on Sunday that he “never approached America” for help and that he was entirely unaware of their presence “until they arrived.” This statement came months after Duterte had ejected the very U.S. special forces that have since returned. While the Philippine government claims that it did not request U.S. military aid, it remains unconfirmed if the Philippine Army requested the aid independently without consulting the federal government. Duterte insinuated during Sunday’s press conference that this may be the case, stating that due to years of U.S. training, “our soldiers are pro-American, that I cannot deny.” He did not explicitly comment on whether the army had asked for U.S. military aid without his approval. The Philippine Army’s ties to the U.S. go back nearly a century, as the Philippines was – for all intents and purposes – a U.S. colony following the U.S.’ overthrow of the revolutionary Filipino government in 1902 at the conclusion of the Philippine-American War. Since then, ties between the two have remained incredibly close. For instance, the entire Philippines Army was absorbed into the U.S. military during World War II by U.S. presidential edict. In the decades since, the U.S. has continued to station military advisers in the Philippines to train its troops and joint exercises between the two nations were routinely held until Duterte became president. If Padilla’s assessment of events is confirmed, it could mean troubling times ahead for the island nation. Nearly every U.S.-backed military coup in history involved the U.S. convincing the military to oust or refuse to take orders from the nation’s president. Duterte has made waves with the U.S. political establishment and likely the pro-American Philippines military for his stated plans to eject U.S. military personnel from the Philippines during his term. He has also widened the rift between both sides by seeking greater ties with U.S. rivals China and Russia. The fact that Mindanao is the very region now threatened by Daesh suggests that documented U.S. intelligence plans to use the terror group as a tool to destabilize and overthrow democratically-elected presidents may now be coming to fruition in the Philippines.